If you're like me, you've had a curious eye on The Banner Saga since it was announced earlier this year. Three former BioWare developers went to Kickstarter before Kickstarter became "Kickstarter" (if that makes sense?) 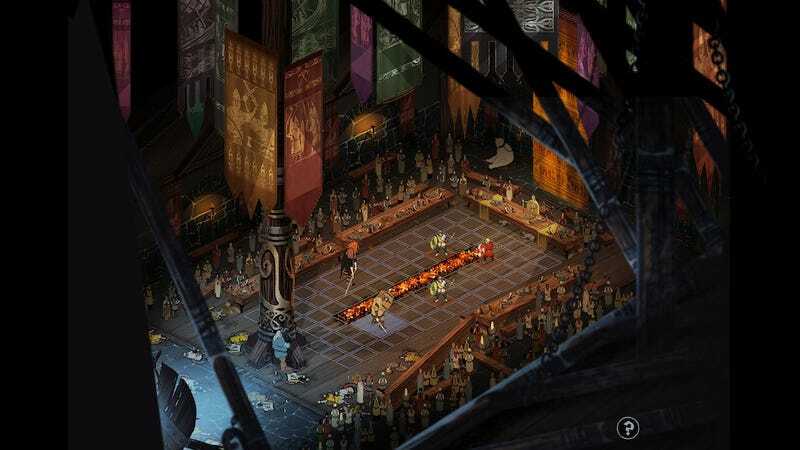 to fund a DRM-free PC/Mac RPG called The Banner Saga. This particular scene takes place in the building at the top of the hill in the City of Strand that we showed last week. Now, viking great halls were rarely this large, but we need enough room to back the camera out far enough for players to actually see enough of the game board so I used some creative license and on top of that we might as well make it look as cool as we can. After getting the basic size of the area down I start sketching in ideas from the story that Alex has laid down for the particular combat space. Here we have a feast going on with the governor of the City of Strand at the main table. I play with color and lighting and materials until I feel that my brain is a good place to understand what it is we're after. How many guests are at the feast? Were vikings sloppy eaters? Should there be a polar bear chained to the wall? Questions like these are nailed down in this stage. Neato. Actually, the vikings don't look like they're too messy. Most of the mess is caused by all the dead bodies.